“Andrew Bird: Fever Year” is a snapshot of Andrew Bird. It is a moving picture taken over a year of touring and laid out before the viewer in one hour and twenty minutes. A beautiful film that is sipped, not gulped; should you choose to partake, you will be treated to selections from a Milwaukee performance while spending time with Andrew on his family farm, in the studio, and of course, on the road. Read more of my thoughts on the film at Indy Film Fest 2012: ANDREW BIRD: FEVER YEAR. 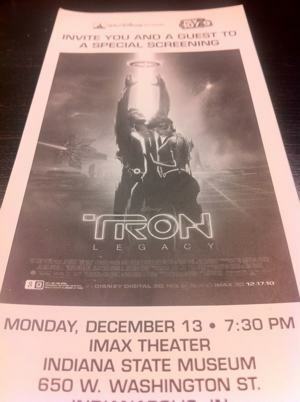 Thanks to Downtown Comics in Indianapolis, and Dodge from MOKB’s ability to purchase comics, I was able to catch Tron Legacy in 3D at the Indianapolis State Museum’s iMax Theatre Monday night. I must say, it was a worthwhile experience. I definitely recommend watching the original before you go, as the film is not only full of eye candy and epic action, but nods to the original film as well. The plot is what you’d expect from the trailers, and not much more, but I left wanting more; which tells me Disney has definitely set Tron up for a new franchise. My only criticism is the Jeff Bridges CGI. I’ll try to not to spoil anything – let’s just say that sometimes it works, and sometimes it doesn’t. As I mentioned, it is worth seeing at the iMax if you can. This was the first feature I’ve enjoyed in that experience, and I’ll look to do it again. The 3D in the film is tasteful and enveloping, and helps bring the viewer into the new, updated world of The Grid. The Indianapolis State Museum iMax is raffling off a working vintage Tron arcade game as well during the run, so be sure to enter the contest, and throw a big Tron themed party if you win. This weekend was a blast. My son went to Grandma and Grandpa’s for the weekend, while Jen and had a busy weekend full of the fun work. The video above is of Today The Moon Tomorrow The Sun playing at The Indieana Handicraft Exchange. TTMTTS is an insanely great band from Atlanta Georgia, playing at an insanely great event that Amanda and Neal Taflinger helm. Thin Fevers was fortunate enough to get to share a bill with them later that night at Local’s Only to an unfortunately small crowd. However, those in attendance left with melted eye-balls à la Raiders of the Lost Ark – if you ever have a chance to see this band, do. Day two of the Handicraft Exchange was equally as fun – EleanorMac did very well, and while Jen was selling, I was busy buying from Mike Altman, Clinton Reno, and some other vendors.